I pulled into the Spittal of Glenmuick car park at about 8am. 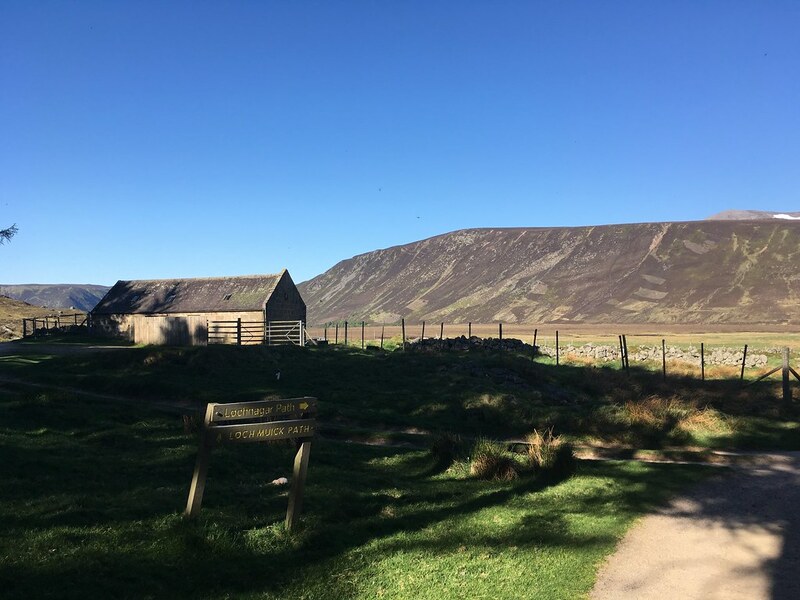 It's a £4 charge, but the facilities (toilets, visitor centre) are a step above the average car park in the middle of nowhere, so fair enough I suppose. 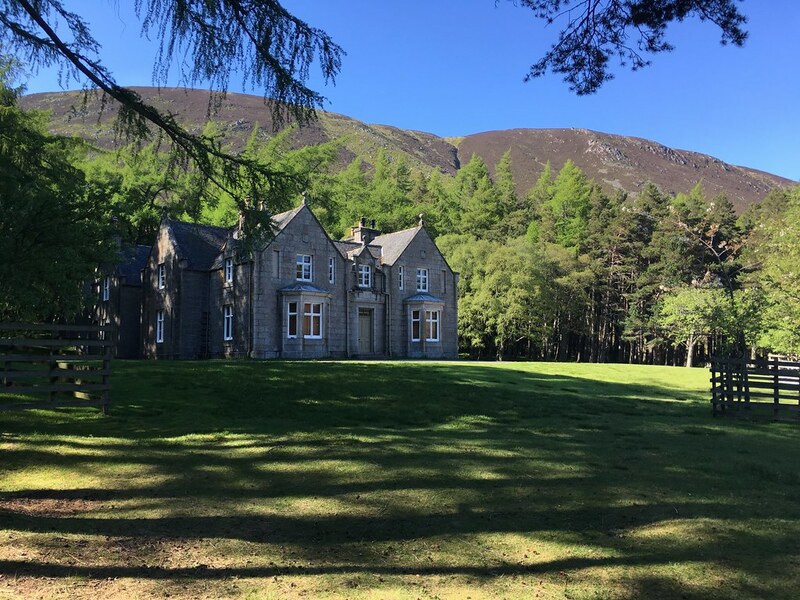 It's a lovely spot with nice woodland all around and mountains looming temptingly overhead. 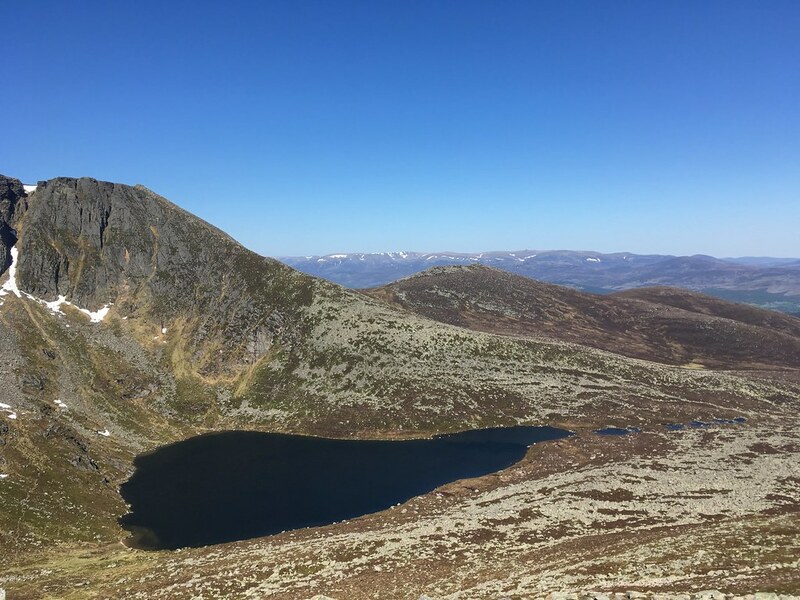 You can just about see Lochnagar from the start of the walk...at least you could today which was shaping up to be a scorcher. Not a cloud in the sky and the air was full of birdsong. The path crosses some open ground and enters a lovely patch of woodland just to the left of the first building you meet...you only start to gain some height once out the other side of the trees and onto the open hillside. The path is very well maintained and easy on the feet...a sort of sandy track for the first few km at least. From this point it's more of a typical mountain path rather than the track it's been so far, but it's still very well made and pretty easy going. 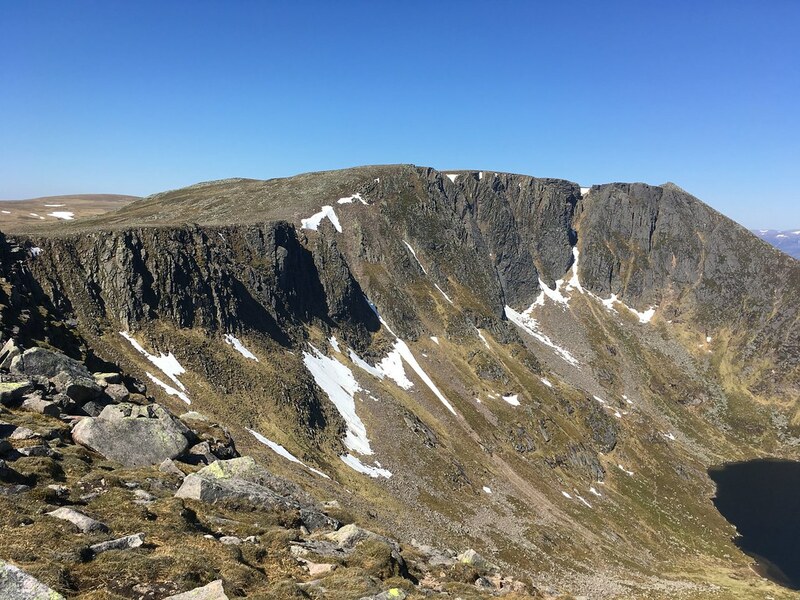 It climbs a bit more steeply now to the bealach between Meikle Pap on the right and the main bulk of Lochnagar on the left. I decided that as I wasn't in any hurry and it was going to be a long day that I'd take in Meikle Pap and use it as my breakfast stop. 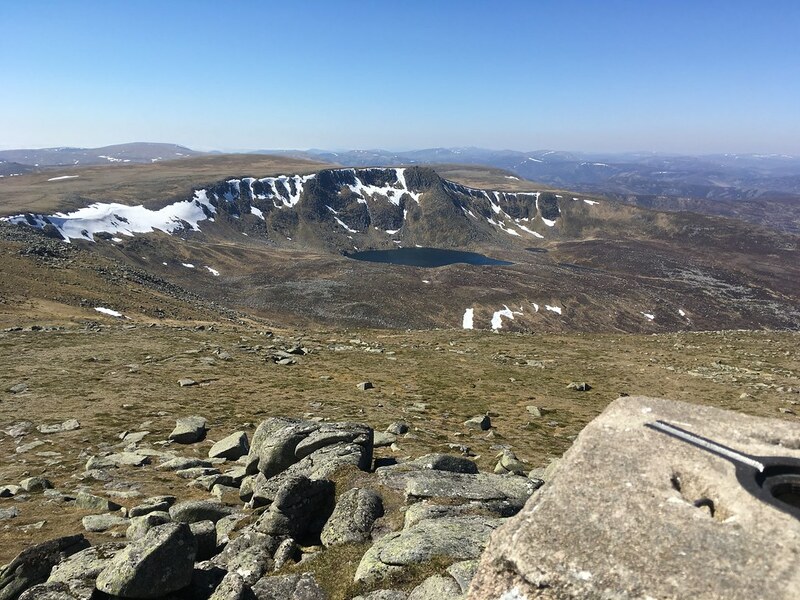 I'm glad I did because it gave some cracking views, not least of Lochnagar itself. 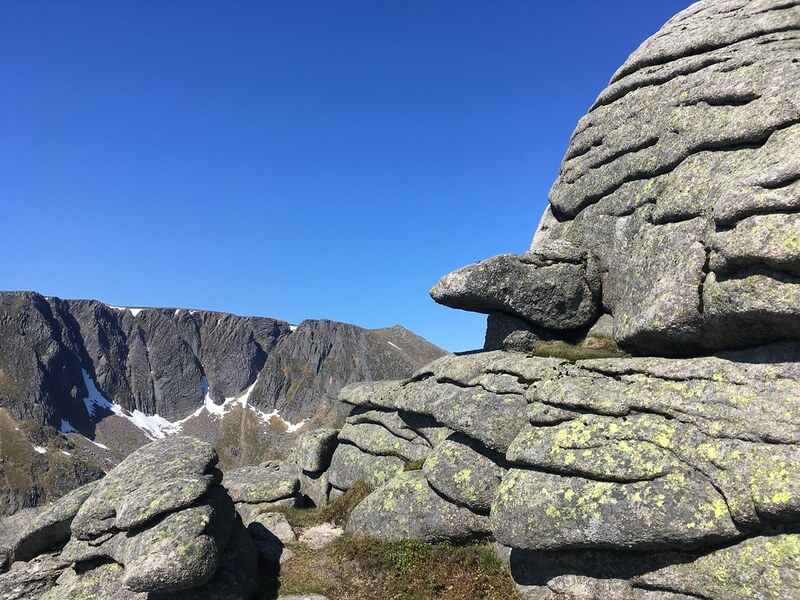 Approaching the summit of Lochnagar the first thing you see is a huge cairn...this is Cac Carn Mor. 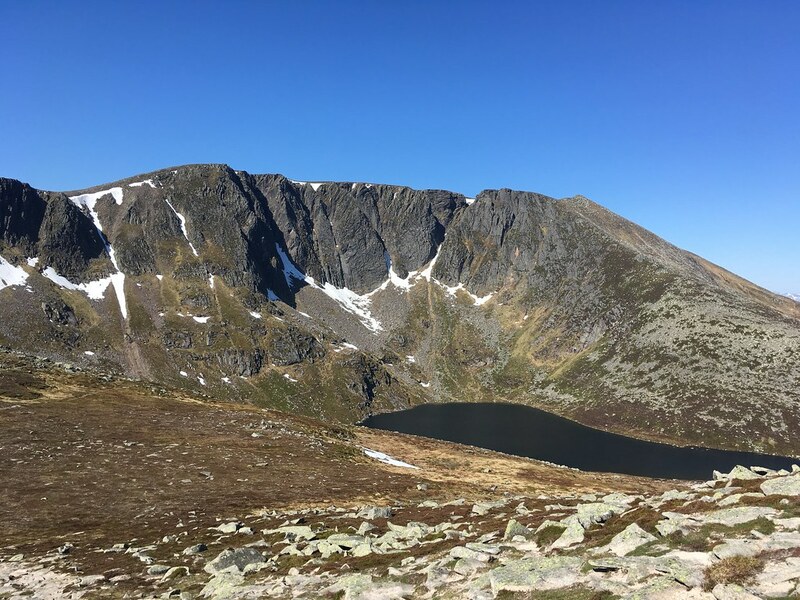 Just beyond this is a rocky peak - the true summit of Lochnagar and confusingly named Cac Carn Beag. Did they get their measurements wrong when they were being named I wonder? 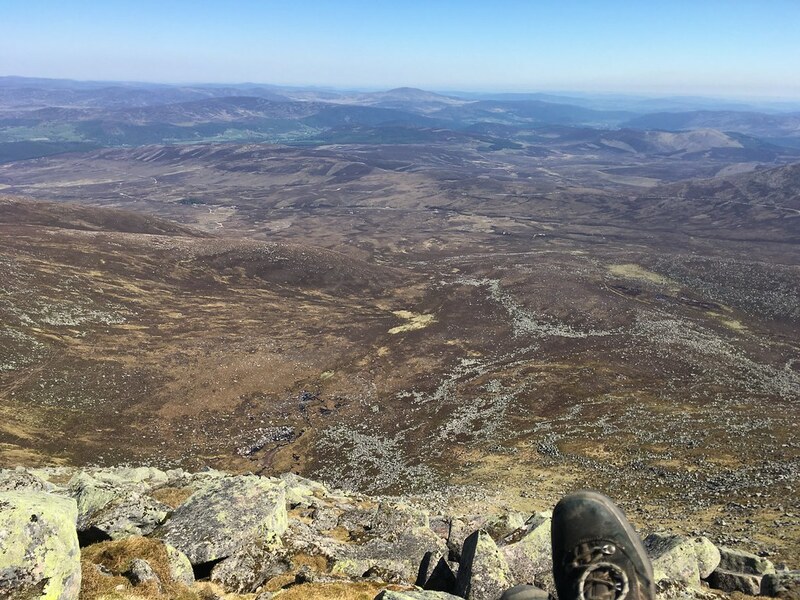 From the summit you can see the next Munro on the agenda - Carn a' Choire Bhoidheach. 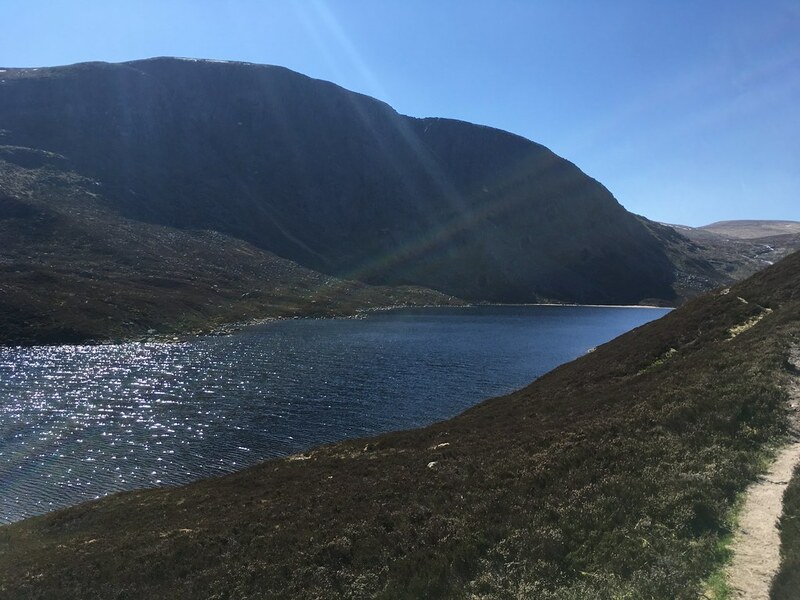 It's the barely distinguishable lump just to the left of the much more impressive The Stuic which juts out over Lochan nan Euan. It wasn't too long since breakfast, but I decided this was a great spot for lunch, so I found somewhere sheltered from the wind and tucked in. 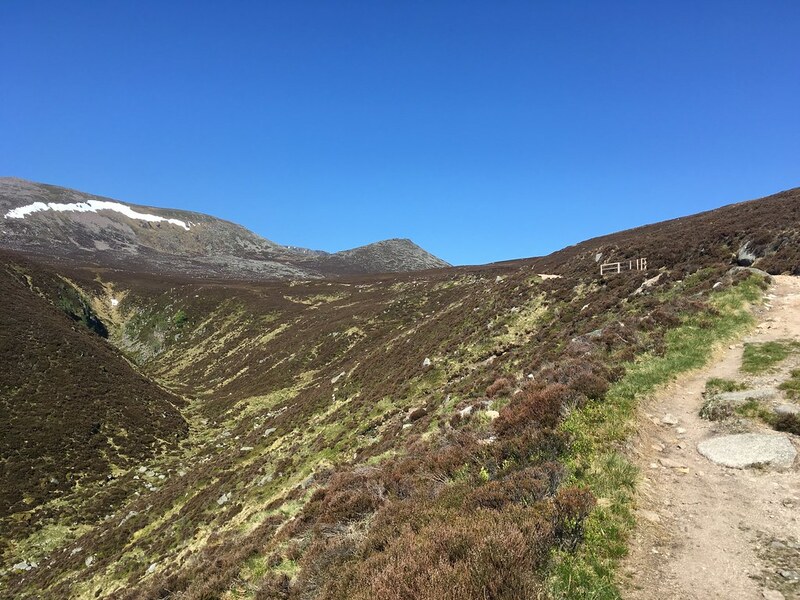 The path to Carn a' Choire Bhoidheach is straighforward and easy going. 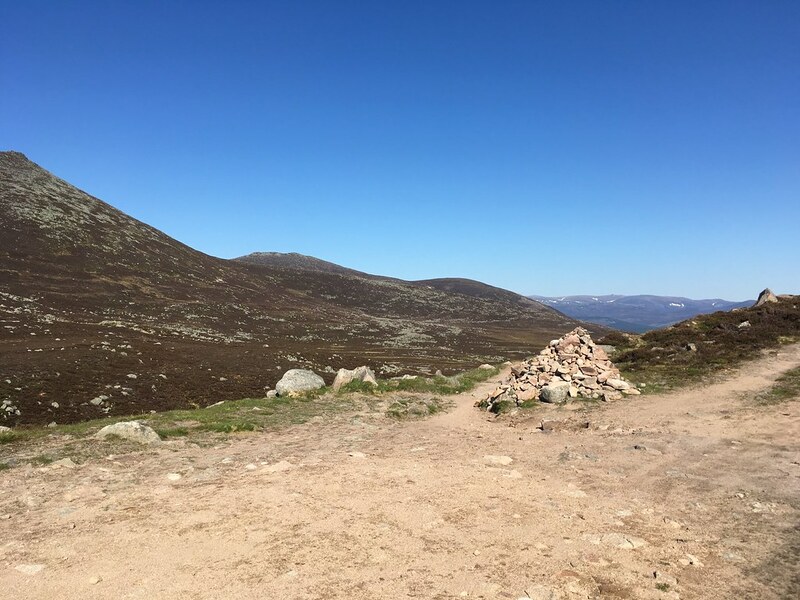 Just descend back towards the huge cairn at Cac Carn Mor and carry straight on then round to the right. If you want to visit the The Stuic - and I suggest it's worth the short detour - look out for a faint path leading through the short vegetation that branches off the main path on the right. 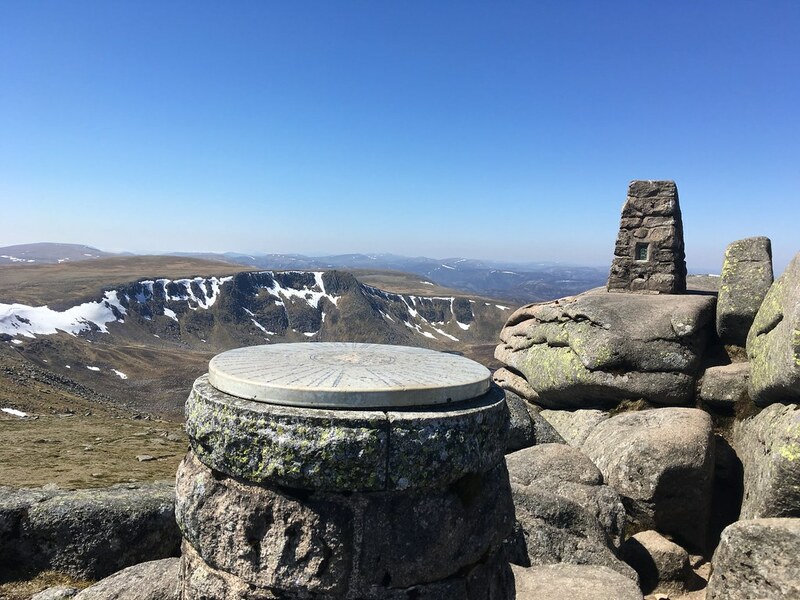 The views from here are again spectacular, especially those back to Lochnagar. From The Stuic there's a very obvious path leading up to the second Munro of the day - Carn a' Choire Bhoidheach. Let's face it, if it wasn't on the list nobody would go anywhere near it! 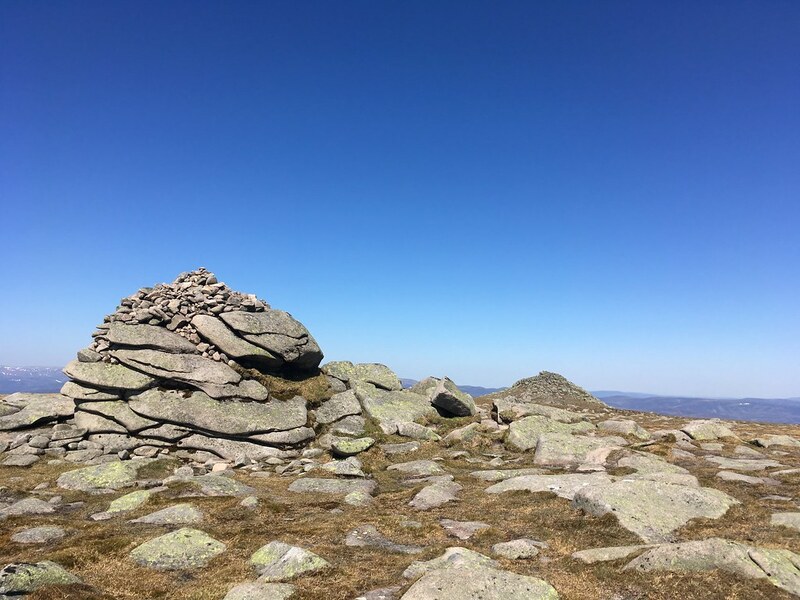 There's a desultory cairn on the summit...and that's about all I can find to say about it! 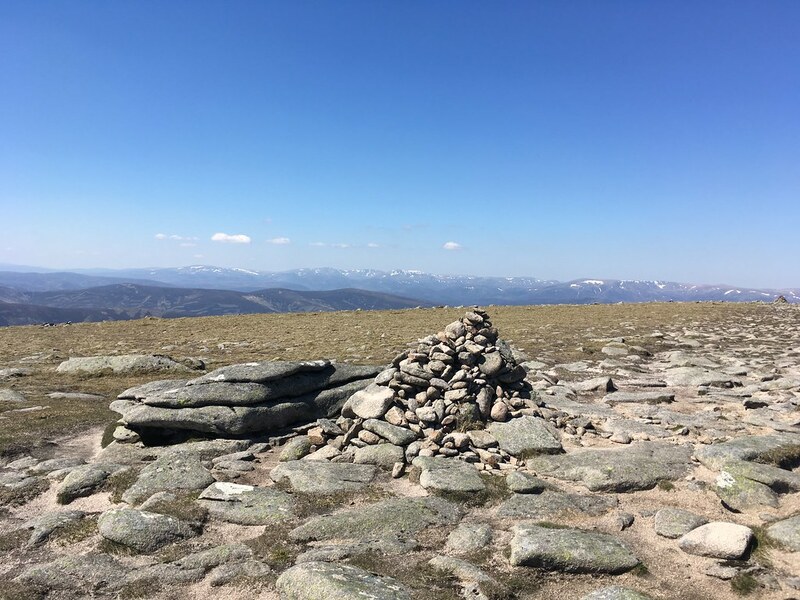 Rather than return by the same path it seemed more sensible to just head off from here in a roughly westerly direction to pick up the path to Carn an t-Sagairt Mor. It was easy going on the descent and the path was very visible all the way, so no problems there. However at this point I started to have a crisis of confidence! 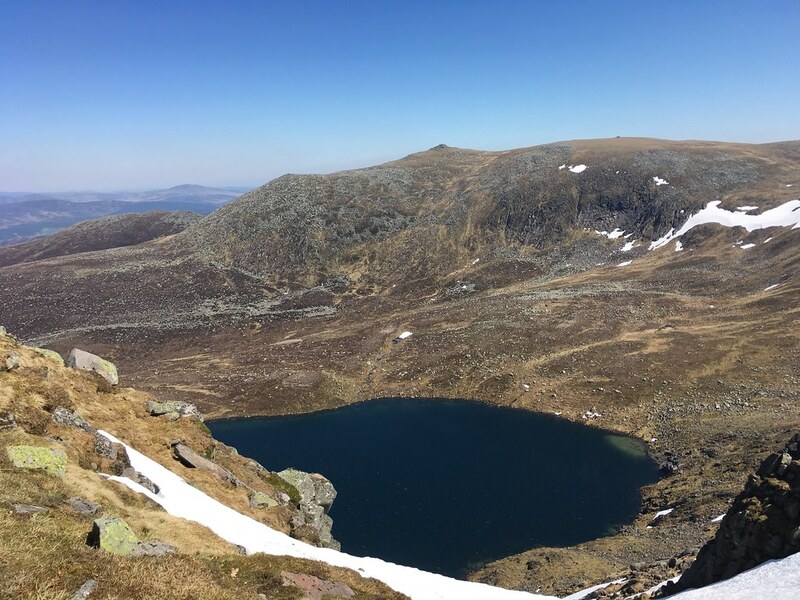 This was my first Munro day out of the year, the wind was howling, the sun was beating down, I was running low on liquids and the final summit of the day looked a lot further away than it did on the map! I had to give myself a stern talking to to avoid bailing out at this point and heading back. I eventually convinced myself that I'd never forgive myself if I left this last hill dangling when it was so close...so I got my head down and forced myself onwards. This stretch was the first time I'd come across any bogginess so far...nothing serious and easily negotiated. 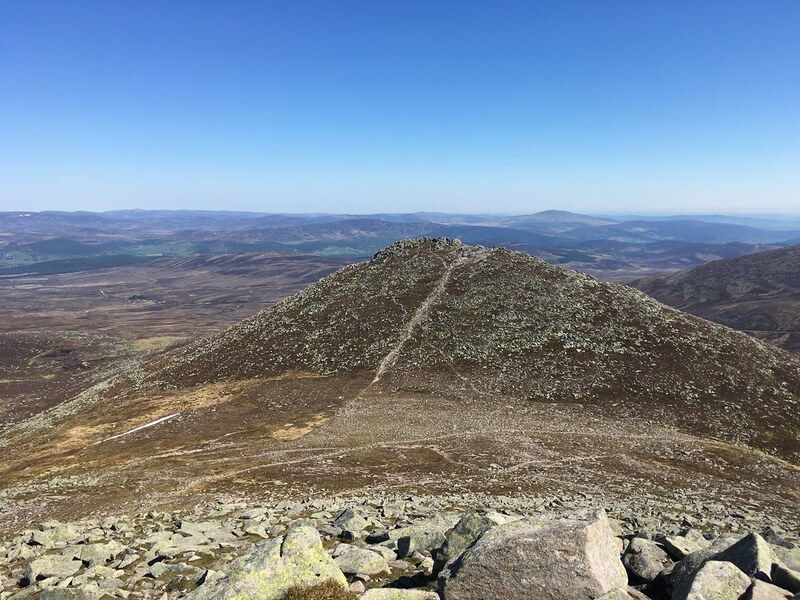 I followed the path that skirts around the south of Carn an t-Sagairt Mor until it reached its high point and then just headed up hill. Again the vegetation was short and easily managed, and after an initial steep bit it soon eases off and you're soon on the summit plateau. 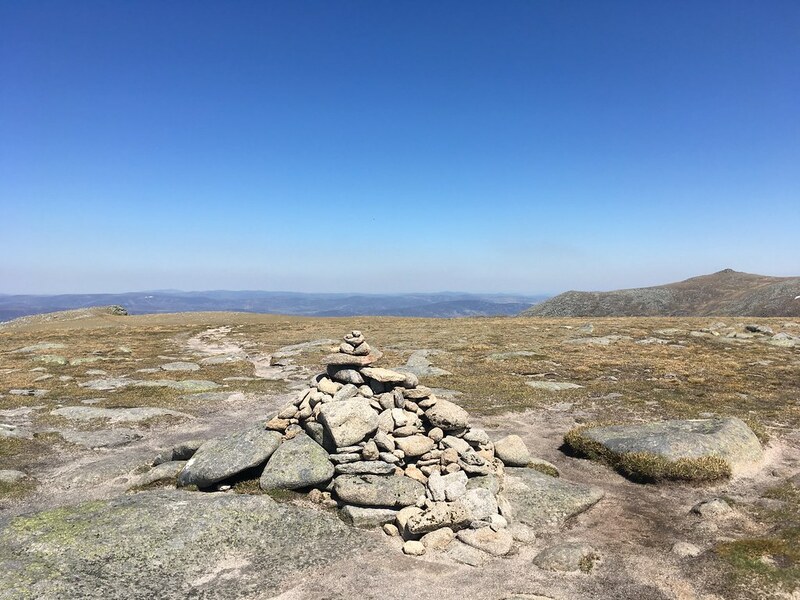 Just to the north of the summit cairn there's another cairn. Of course I had to visit that too, just in case! 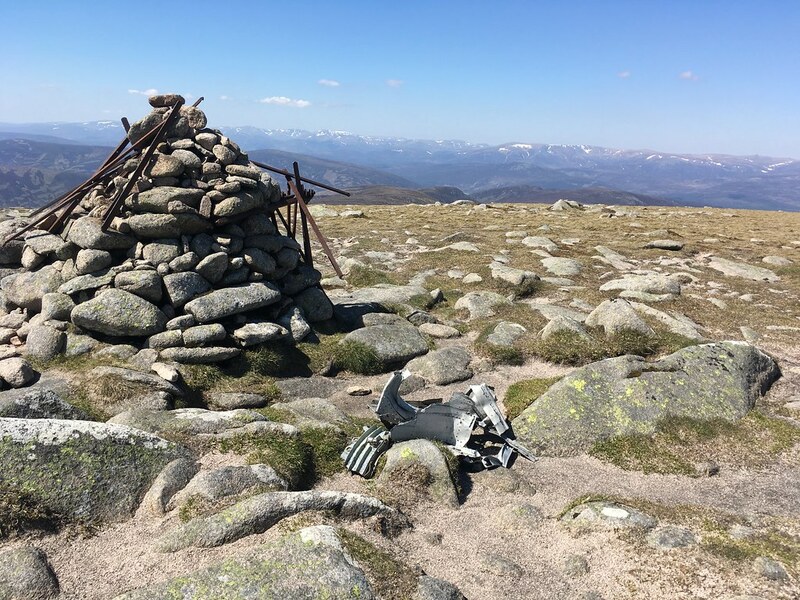 I'm not sure why it's there - it's clearly lower than the main summit cairn - but there was a piece of plane wreckage next to it, so maybe something to do with that? Now for the home stretch. 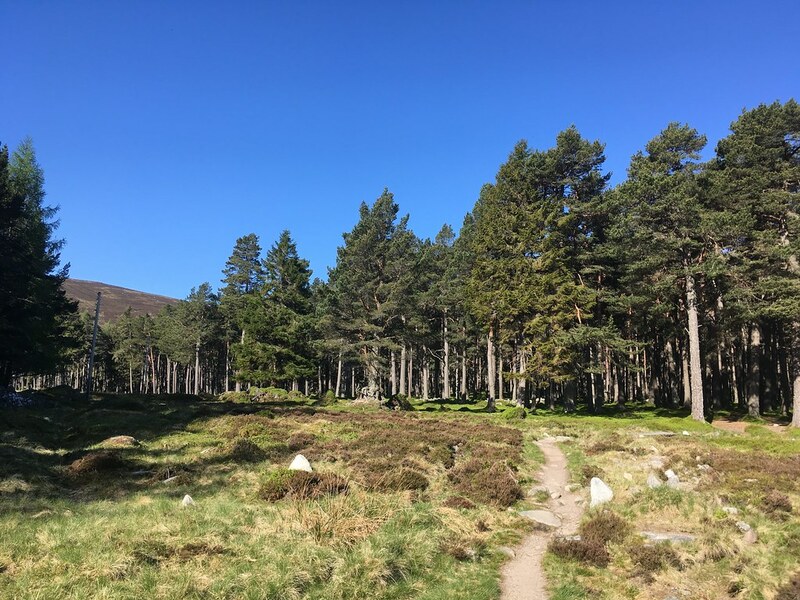 I hadn't really given this much thought other than to head directly for Dubh Loch, specifically the left-hand shore where there was a path marked on the map. On the map it looked like the descent would be a bit of a slog, and looking at it in the flesh it looked rather worse. I feared it was going to be a boggy nightmare in fact, but actually it was fine - no doubt the recent dry spell helped enormously. 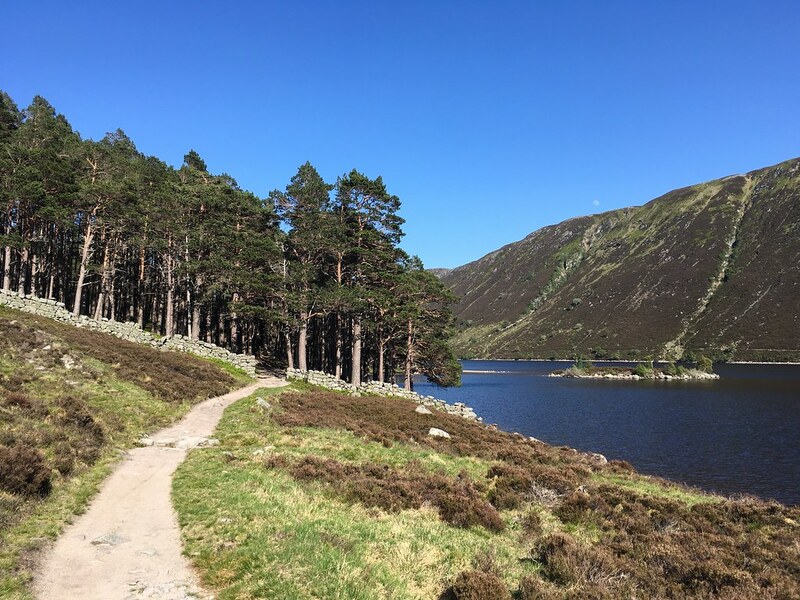 It was a bit of a slog to be honest - especially as I had about 20km already under my belt at this point - but the last section of descent alongside the Allt an Dubh Loch was delighful, with the river cascading over the stony river bed and down towards the Loch. 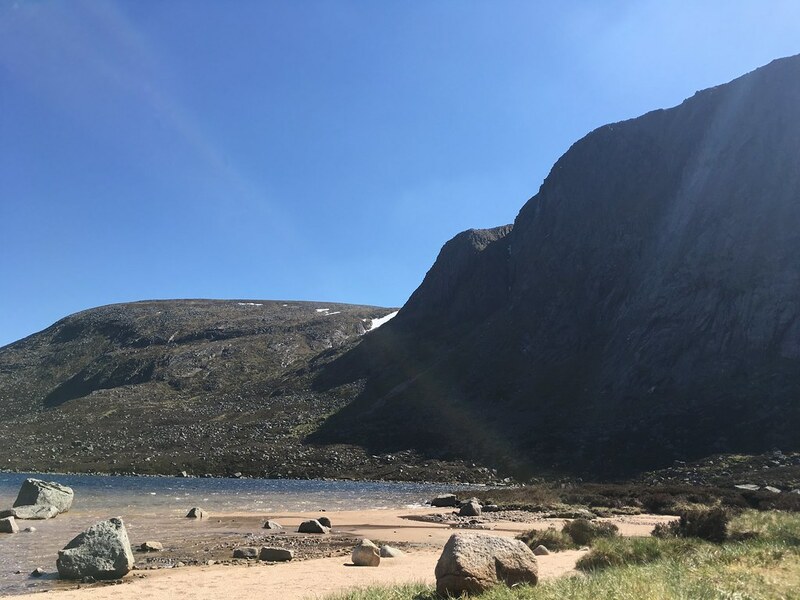 There's a nice wee sandy beach waiting for you when you finally get down to shores of Dubh Loch. It was a lovely spot and I took the opportunity to bathe my aching feet. 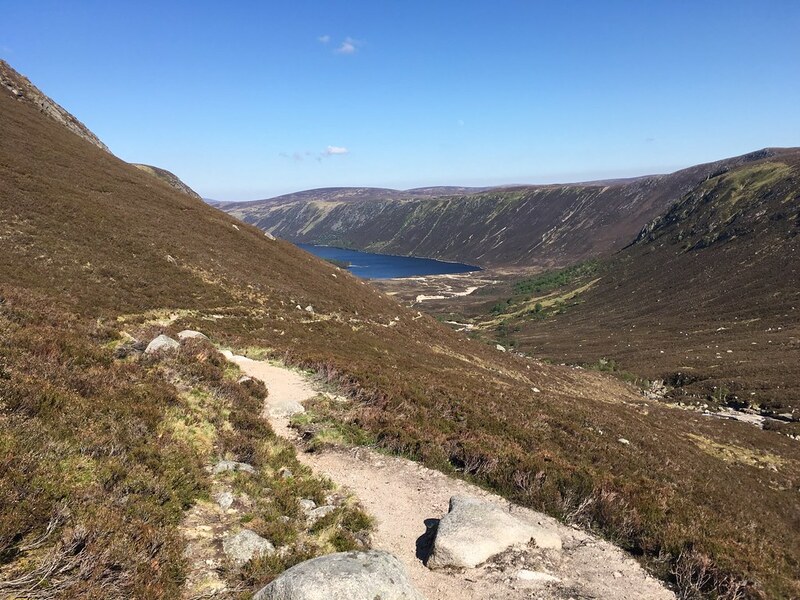 I would have hung around longer, but the wind was still blowing annoyingly hard, so after a few moments of contemplation it was time to head off along the path towards Loch Muick. The crags of Creag an Dubh-loch really make this an atmospheric spot. The path back remains well-made and maintained, although it's a bit more "rustic" than most of the others so far on this walk. 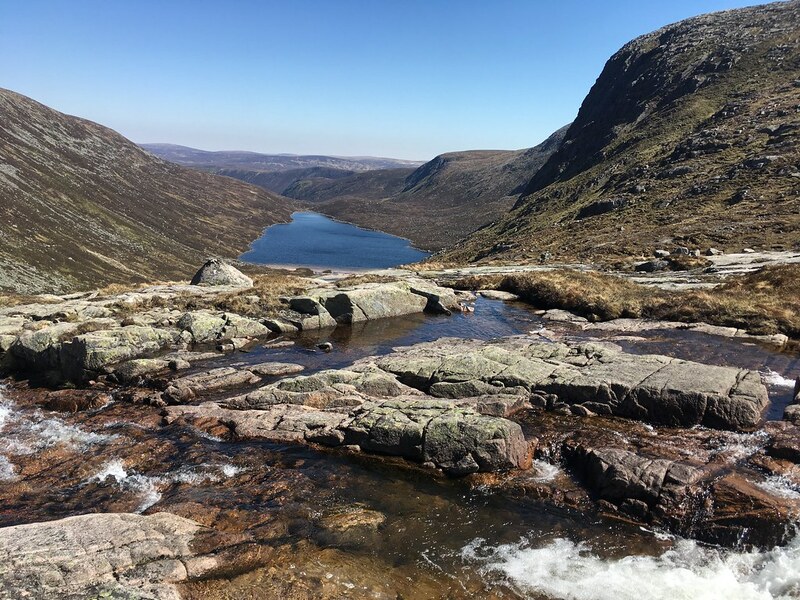 My poor legs were really starting to suffer now, and the stretch to Loch Muick seemed to take forever. Eventually though it appears...but don't let that fool you. There's still a long way and a lot of descent to go before you reach level ground again. 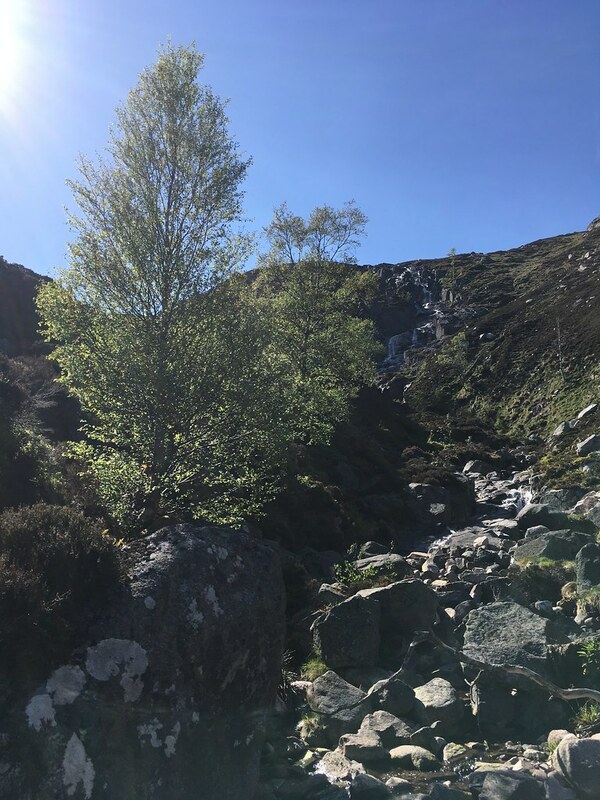 A bonus is the waterfall of The Stulan which provides some interest about half way to Loch Muick. 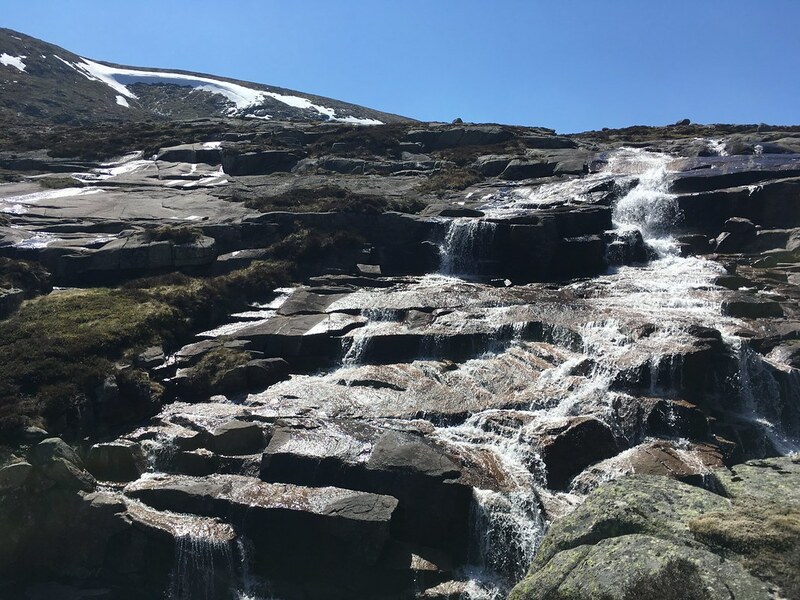 The Stulan waterfall - definitely NOT in spate! 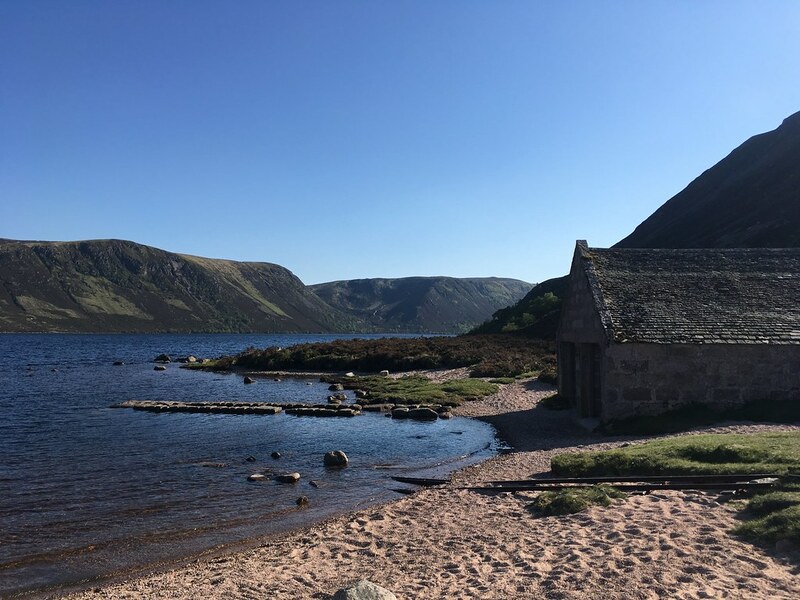 After what seemed an age I finally reached the shores of Loch Muick. 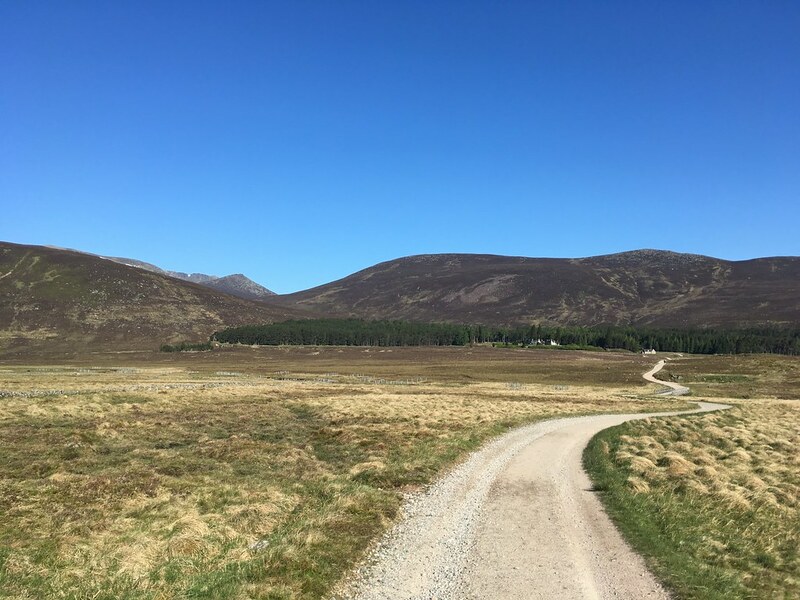 After an ititial pleasant stroll through the woods of Glas-allt-Shiel the final stretch back to the car park is a bit of a boring trudge in all honesy...or maybe I was just too knackered to enjoy the admittedly beautiful surroundings! At the boathouse at the far end of the loch a path branches off to the right, skirting the pebbly beach (not as nice as Dubh Loch's) and then joining up with the track that takes you the final kilometre back to the car park. Last edited by StevieC on Tue Jan 22, 2019 10:45 am, edited 2 times in total. Nice to see this in summer clothing. 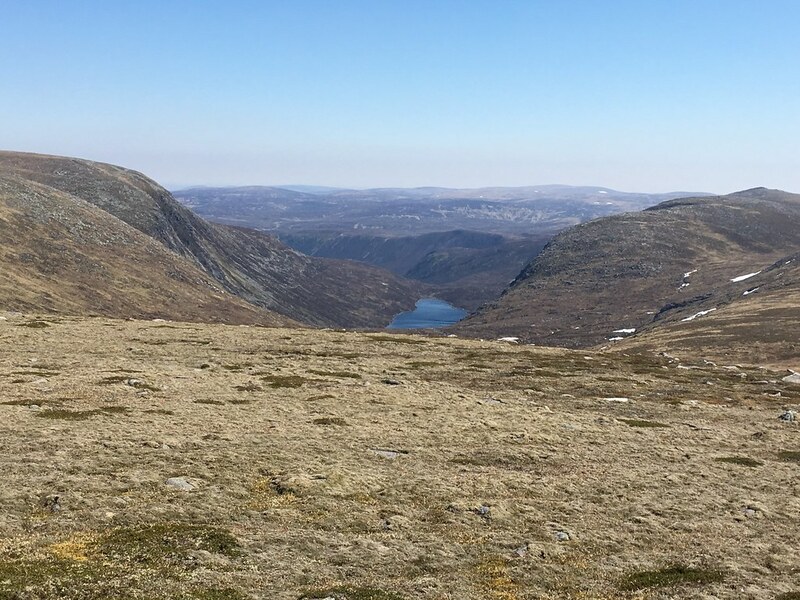 I did a very similar round in April when it was much whiter, and then in the afternoon there was a lot of clag, so the views of the White Mounth cliffs etc. were not as good as yours. Alteknacker wrote: Nice to see this in summer clothing. 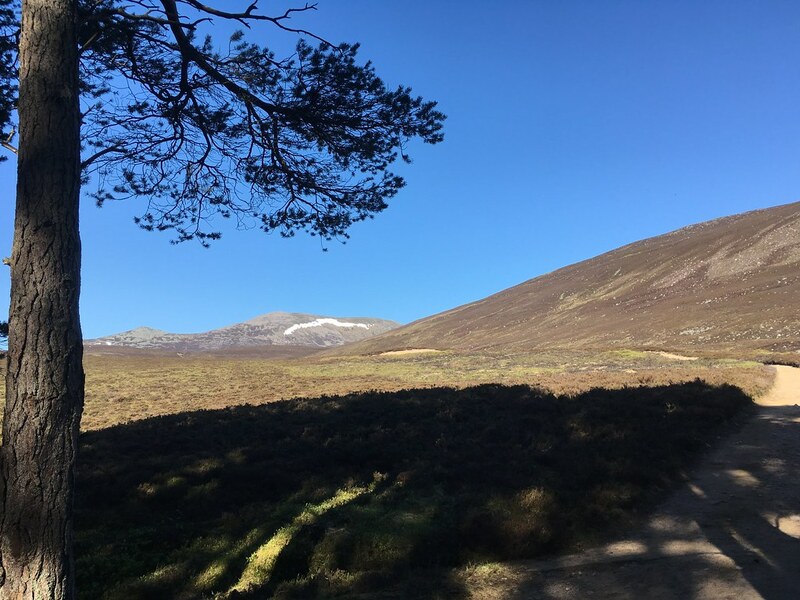 I did a very similar round in April when it was much whiter, and then in the afternoon there was a lot of clag, so the views of the White Mounth cliffs etc. were not as good as yours. 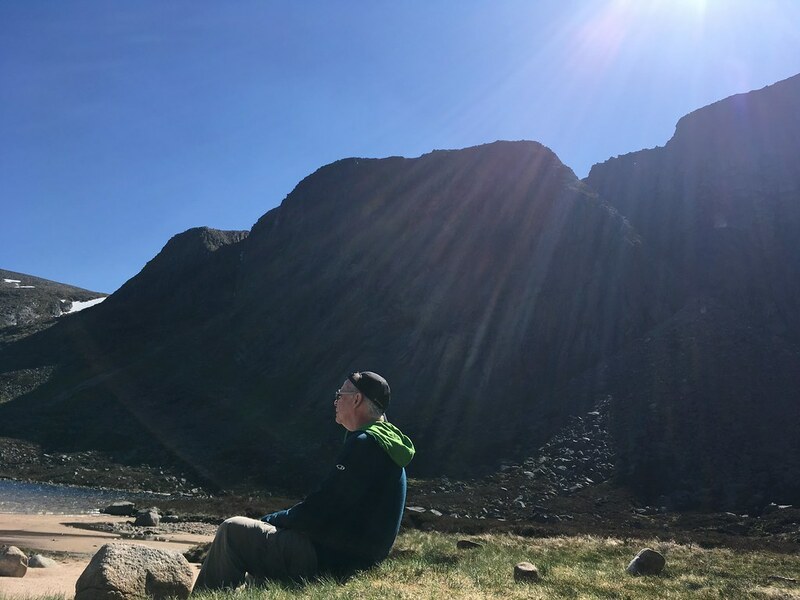 Because of the wind it was still pretty chilly on the summits hence the hoodie...about five minutes after that photo by the loch I was down to tee shirt and shorts! Hi KatTai it's a big day out with a long slog at the end, but I'd definitely recommend it so hope you go for it!